Brian is on the right track. Edit: Just saw the last post from Wei. Will look forward to a future release of subread. Edit2: There was an error in the copy/paste of the data in original post. I have replaced the original with correct copy. Last edited by GenoMax; 10-23-2015 at 11:03 AM. Thanks for providing the sample reads. However, we noticed that there are missing columns in your mapping results (either PNEXT or TLEN or both). This might cause problems for read counting by featureCounts and lead to incorrect counts. For example, featureCounts might not be able to find NH tags which are used to identify multi-mapping reads. All of the columns are present. I have no idea how you were able to generate output missing some columns... could it be some kind of copy-paste error? Or did you reformat the data in some way? That's really strange. It is, indeed, not a valid sam file. When I copied and pasted the data last night something must have gone wrong. I have recopied the data in post above. Sorry about that. Thanks for this wonderful tool. We use it routinely. I had a question regarding the output (.featureCounts file). What is the difference between a read having more than one gene assigned with commas in one line (Read1) and a read assigned to more than one gene listed over multiple lines (Read2)? The output is a result of dropping the --primary option and including the -M and -O options. Read 1 was reported only once in your mapping result and this read was found to overlap with two genes (ENSNNNG00000079745 and ENSNNNG00000059028) by featureCounts. Read 2 was reported 5 times in your mapping result (5 rows in your bam/sam file). The first two alignments reported for this read do not overlap with any genes and the other three alignments were found to overlap with genes. Read 1 was counted two times because of multi-overlapping and Read 2 was counted three times due to multi-mapping. Thanks for the quick response and clarification provided. I am trying to use featureCount with a bam file that aligned using Hisat2 with an indexed genome and spliced sites file created from a gtf file. Now I am using the same gtf file in featureCount but am getting 0% Successfully assigned reads. I am not sure what I am doing wrong. These are reads that aligned to the reference genome, my unmapped reads are removed. Are you using the latest version? '-b' is an invalid argument. Could you also provide the assignment summary that can be found in the 'countsSb10.txt.summary' file? Would it be possible to include an option for outputting a tagged bam file (similar to the htseq --samout option) in the next release. Basically a bamfile with a XF:Z: tag that has the name of the assignment there. We're using this currently to allow umi-tools pcr deduplication of RNAseq reads on a per gene basis, and use the FC -R files to add the tag to the bamfiles ourselves but it would a lot faster if featurecounts could just output the tagged bamfiles. I am new to RNA sequencing analysis and just finished assigning my reads using featureCounts. I am trying to save the output of featureCounts into a txt file and am having trouble. I would like to add gene name to the output to identify counts better. How can I do that? What command should I use? You saved the 2nd to the 4th columns in the annotation data frame into the file. These three columns are the chromosome names, start and end locations, as you had in the output. I have problems getting correct counts for a stranded RNA-seq study using hisat2 version 2.1.0 and featureCounts v1.6.4, and I would appreciate any help. 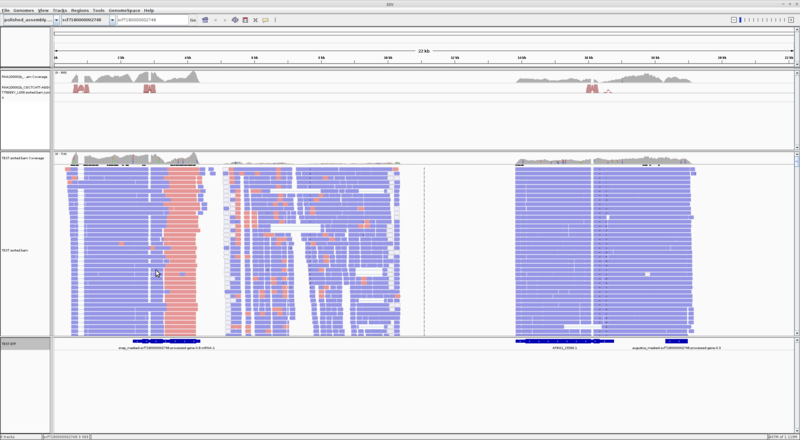 For example, the second last gene (AFBG1_15566.1) is only covered by transcripts of the same orientation (blue reads). I can't understand why featureCounts finds about the same counts (2383 and 2257) in both orientations. Last edited by Guillaume; 04-09-2019 at 06:37 AM. I found that you did not use the "-p" option in your script to run featureCounts. This means that each single read, not read-pair, was assigned to the genes. FeatureCounts only flips the strand of the second read when the "-p" option is specified; otherwise it simply looks for the 0x10 FLAG in the alignment for matching the strands of the gene and the alignment. Half of your single reads (R2s) were from the positive strand, while the other half (R1s) were from negative strand, hence the AFBG1_15566 gene always has counts no matter you used "-s 1" or "-s 2". I changed your script by adding the "-p" option to featureCounts, flipping all your R2s to the negative strand. Now using "-s 1" has zero count for AFBG1_15566, but using "-s 2" has all counts for AFBG1_15566.